Taylor Worth. Australian international. Gold medallist at the 2010 Commonwealth Games. Brady Ellison’s nemesis. All-round nice guy who was kind enough to answer my questions. Thanks! You’ve just been working with Coach Kim in his near-mythical archery school in Korea. What’s a typical day out there like? Is there a typical day? A typical day at the academy is 9am start and just shooting until 12 then a break for lunch from 12 until 2 or 2:30 with a cycle into the local village for food, then training again until about 6 or 7 in the evenings. Typically when someone arrives there we score something, e.g. 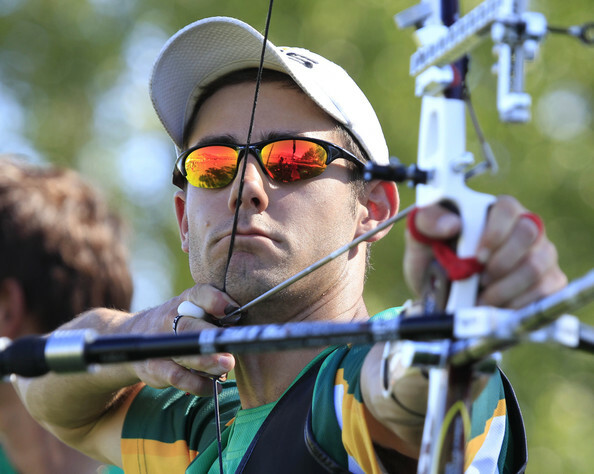 FITA or double 70, then video analysis and changes are made at short distances for a few days before attempting scoring again to see what the improvements are to performance, with video comparison at the end of the camp. What was the biggest change he’s made to your shooting? He has made quite a few changes to me over the past few years, but the biggest would be a total structure and form change at the start of 2012 which I feel helped me get to London. You wrote elsewhere you’ve just started using a new 70″ bow. What difference has that made? I did say I was using a 70″ for a little bit, but i have changed back to a 68″ just with a different combination. changing from a 27″ riser with short limbs to a 25″ riser with medium limbs. What’s the food / company like out there? I really enjoy the food over there, it’s always really healthy and good for the body and the company is always friendly and I meet new people every time I go over. I saw you shoot in London last year, and I think I’d describe your shooting style as… ‘classical’. Have I got that right? Haha! I’m not sure what i would ‘classify’ my shooting style as but I would like to think of it as simple. Is there anyone’s else’s shooting style you really admire? There are a lot of archers out there with great form but none that stand out as something I admire. Everyone is great in their own way. What are you gearing up for this year? I have had a lot on my plate with year with camps and competitions, but the big one this year is obviously the world champs in Turkey. I would have liked to make the World Cup finals, and I still have a small chance to make it but I will need a very good result from World Cup 4 in Poland later this month. Honestly I don’t have anything in my pockets right now as I’ve just woken up and thrown some trackies on, haha. The last song I listened to was Closing Time by Semisonic. Cheers Taylor. Good luck in Poland! (Taylor’s Facebook page is here).